In the centre of the photograph is the shop of Robinson Bros with an awning above each of the two shop windows. There appears to be row upon row of vegetables in almost every garden. I have no doubt that most of these gardens are now laid out to lawn and flowerbeds. Click on Large Version to see more detail. Please can anyone tell me where in the High Street is located Ireland's Yard. It appears from old records, that my great-grandfather, John Jesse Tomsett, ran a broom-making business and my ancestors lived in a house in the yard. Ireland’s Yard did not appear in the aerial photograph above as it was located behind the old garage, next to the Post Office Stores. 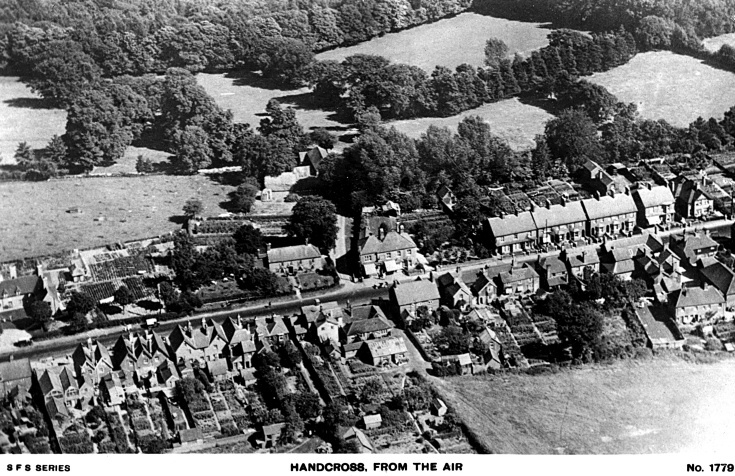 In picture #1367 it is the cluster of buildings just to the left of the Zoar Baptist Chapel, and later to be known locally as Mr Archie Quick’s Yard! In 1794 the buildings were sold by Samuel Smith to wheelwright Charles Steele and blacksmith Michael Humphrey. The stables were converted to a house and a barn was converted to a wheelwright’s shop. Some time later they were sold to John Ireland who took over the existing business. In 1857 he was succeeded by his sons, John and William. Select Open Document to view part of the 1842 Tithe Map. It lists John Ireland as the owner of 316 Cottage in two tenements, 319 Cottage, buildings and yard, 320 Cottage on two tenements and gardens, and 321 Tenement, and coach house (since demolished). Other nearby buildings were: 317 Cottage, chapel, and yard, 318 Cottage (demolished c.1910), 322 Red Lion.